Day 1 involved meeting in Prague in the evening and the guide then providing an abbreviated guided tour of old Prague. There is so much to see in Prague so if you are considering this tour in the future, it is suggested that you come a day or two (or more?) early so you have time to enjoy all of the many sites Prague has to offer. 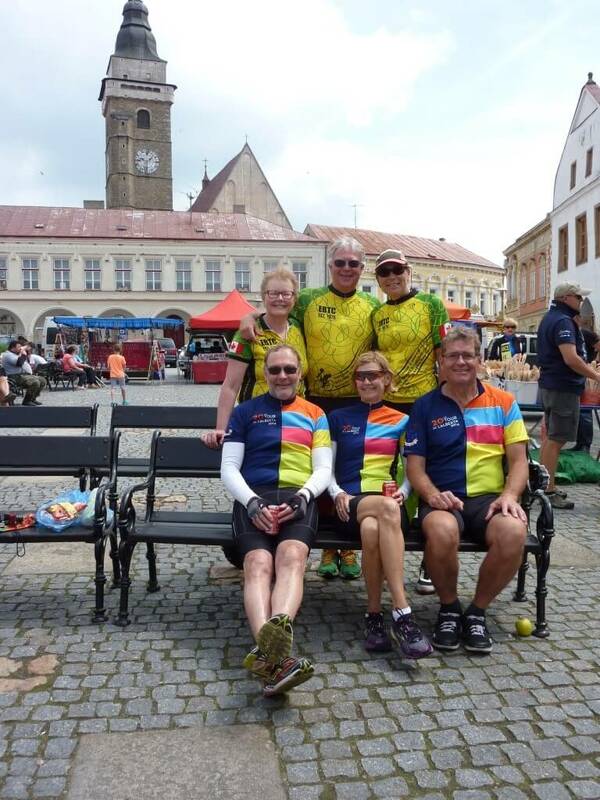 On Day 2 we transferred 150km by bus from Prague to Ceske Budejovice where we collected our bikes and anticipated an uneventful, relaxing trip. Ha! We had lots of adventures that were even new to our very experienced (and awesome) guide. 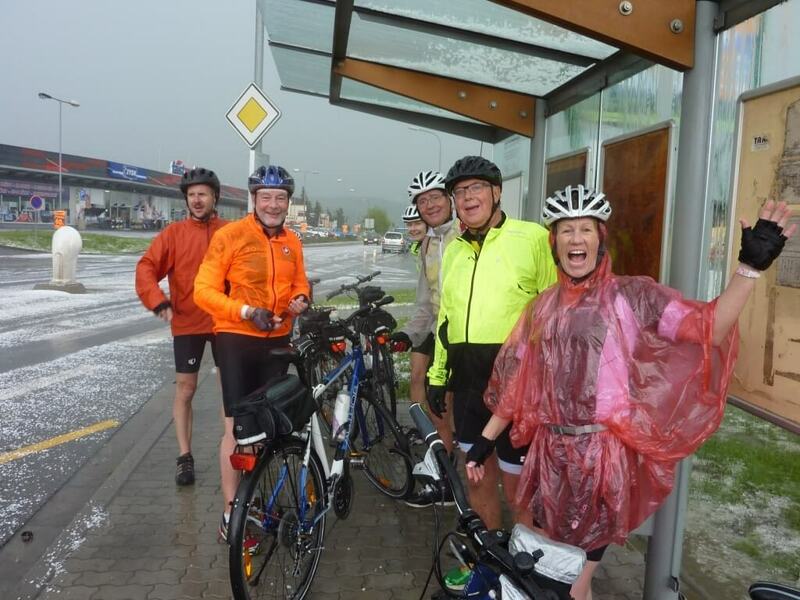 We cycled to Cesky Krumlov on the Vltava River and got caught in what started out to be a major downpour of rain … that turned into us getting pummeled by marble-sized hail. So why are George, Sig, Barry, and Laurie so euphoric in the picture? Obviously hypothermic!!! More adventures to come … the hail turned to rain again and at one point, a river had formed at the bottom of the roadway and, without daring to stop for fear of falling, we had to peddle whilst our shoes submerged into the running water … thankfully nobody tipped over … we all made it through with exuberant hoots and hollers. It was worth a lot of giggles. We ended up at our hotel, got showered, put blow dryers in our shoes, had a ‘required’ shot of our guide’s father’s homemade hooch to warm our insides, and then headed up to the castle for a look-see. The consensus was that it had been a fabulous and extremely memorable day. On Day 3 we headed out into the hilly countryside. 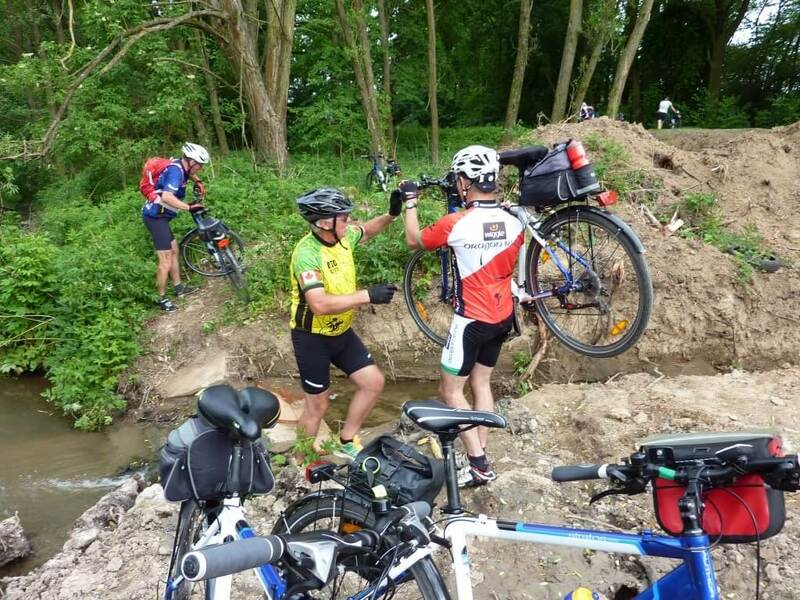 Our route flattened out as we entered the Trebon Basin, a lowland area of forests, meadows and lakes. Trebon is famous for its Carp dishes so we indulged in a hearty meal at one of the many quaint cafés. We missed a sign that said ‘construction’ and ended up having to carry bikes down, over, and around a flooded construction site, then up an embankment to the roadway. Thank goodness for the muscles in the group!! 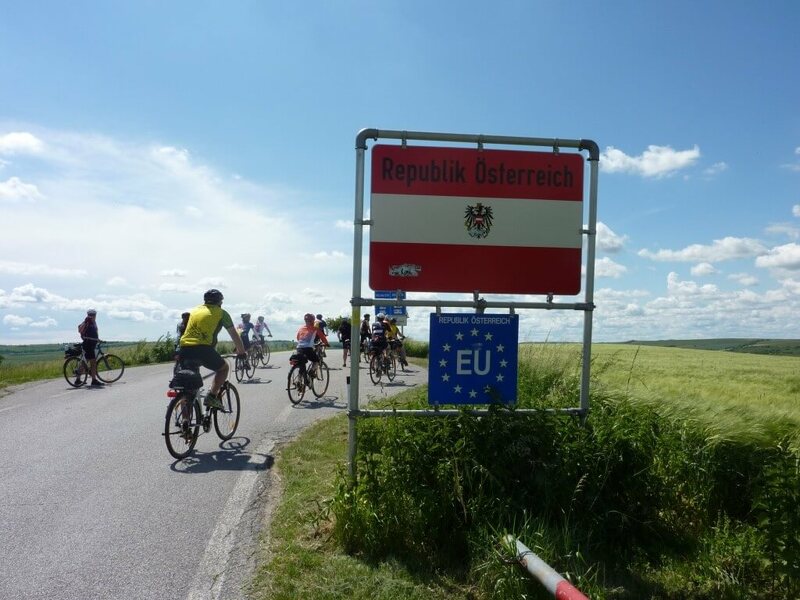 At the time it was cool but not significant that we just cycled across country borders … from the Czech Republic into Austria. Will this change as a result of the Brexit results? 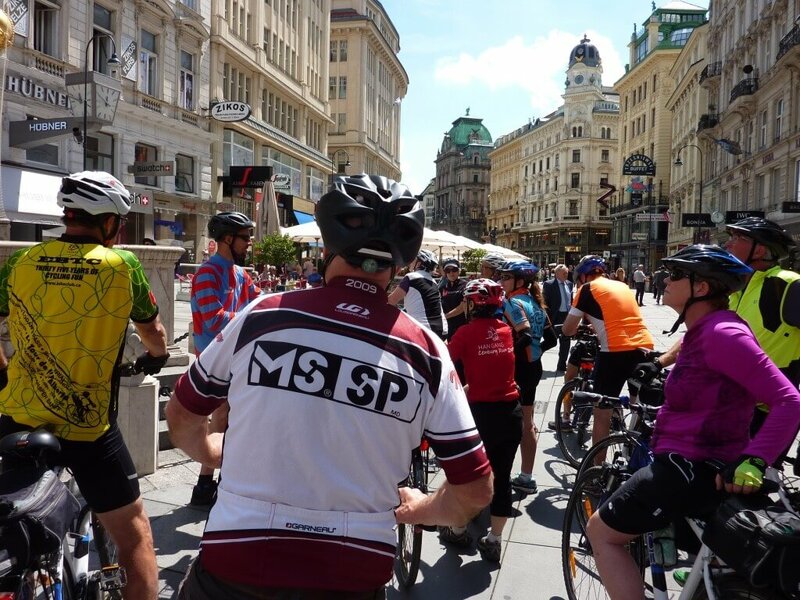 We rode through Vienna to see some of the numerous sites from the exterior … AMAZINGLY beautiful. Outside of Vienna, the Danube River splits into four for a short distance. We had to cross one of these tributaries but the flooding in other parts of Europe were also evident here. The guide assured us that the water would be only up to our knees at most … ha! It came up to our hips and for one little lady in our group it came to her armpits. 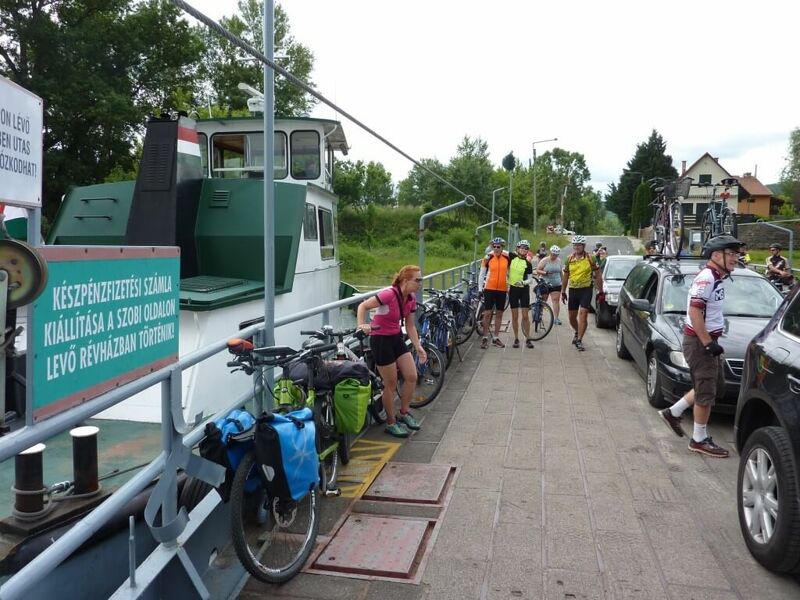 Not the way cyclists usually get to the other side of the Danube. Another adventure to add to the tally. 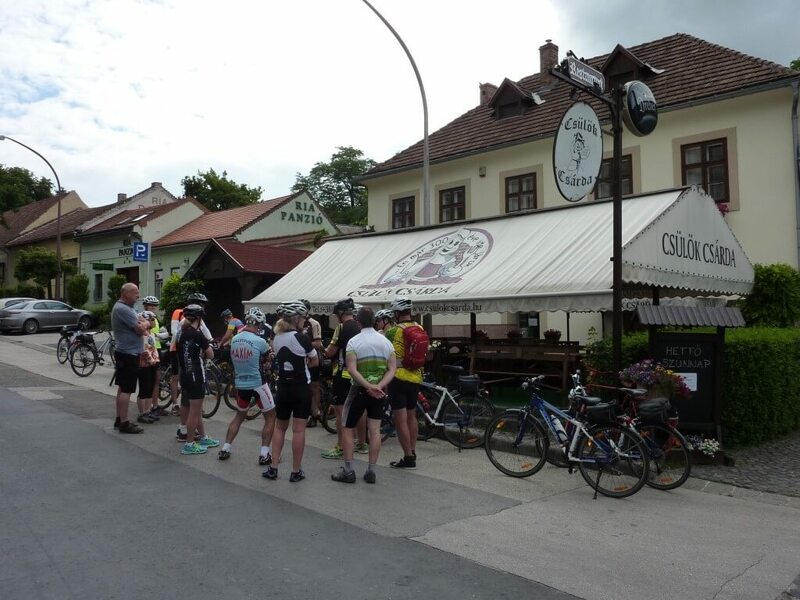 We crossed the border at the town of Hainburg and entered Slovakia, winding our way towards the capital Bratislava. We didn’t go out for dinner with the group and found a small restaurant where I’m almost sure we had the most delectable pork belly on the planet … so good we debated whether we should order another! 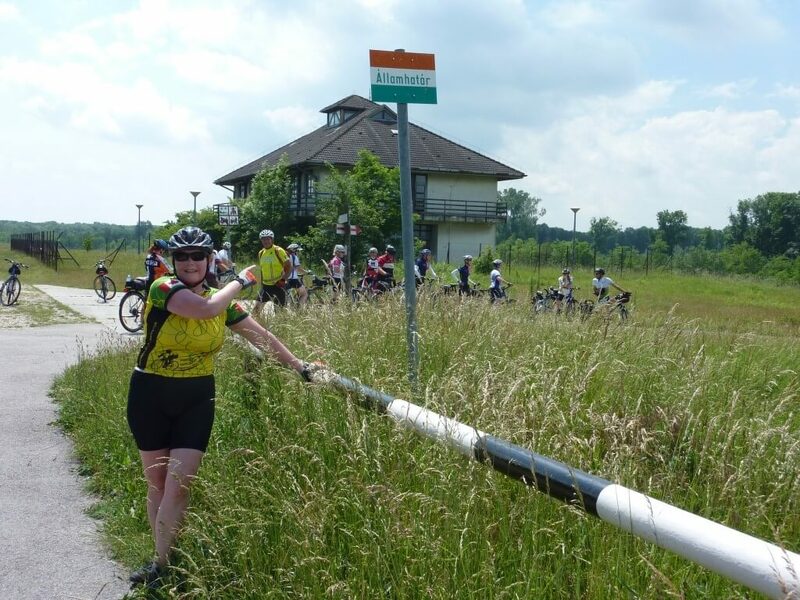 We crossed over into Hungary …. … and stayed at another GREAT hotel. We had dinner near here and the portions were ginormous. I think this is how you are supposed to cross rivers … using a ferry. The trip ended in Budapest but, not really. 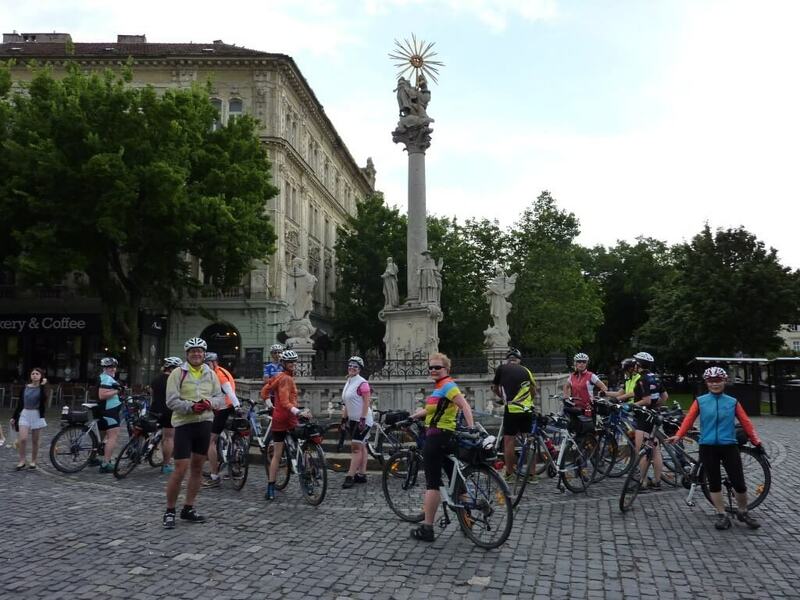 This trip confirmed that cycling is the only way I want to see the world right now. I’m already planning which trip(s) I’m going on next! Great report. Perhaps your next career is being a travel writer.